Uses Life underwriting, i.e. uses our Life underwriting requirement charts. 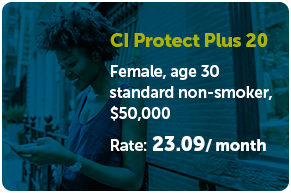 Comprehensive CI protection covering 25 critical illnesses. 3 built-in benefits for added protection without additional premiums. Uses Health underwriting, i.e. 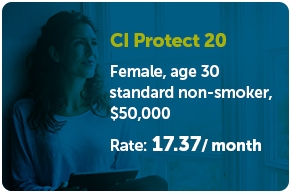 uses our critical illness underwriting requirement charts. 1 Only one $50 annual policy fee is applied. 2 Munich Re’s Individual Insurance Survey, 2016.